The science that caught my eye this week was pretty esoteric. It wasn’t in the news or really even making the rounds of the science alerts I subscribe to. It came in the form of a direct link on Facebook to an article in the prestigious science journal Nature about the architecture of the nucleus of mouse cells, where genetic information is stored in the molecule DNA. The link featured a short animation of the nucleus, spinning around in all orientations, showing off multiple rainbow-colored ribbons of DNA. The new finding in the scientific report was a complicated reconstruction of how each of these chromosomes occupies its own space in the nucleus of the cell during most of the cell’s lifespan. The rainbow colors of the video caught my eye, and the rest of the scientific article that describes the experiment and results used to make the video is also full of eye-popping colors and detailed imagery, which is a little unusual for a technical report in molecular biology. That got my attention, but the rest of the science pulled me in and encouraged me find an hour at the end of the week to devote to reading the article. You see, among other things, I’m a former chromosome biologist, and I still love a good mystery about chromosome behavior. One ongoing mystery in cell biology and genetics is understanding how all the DNA in any given cell is coiled up to fit in the nucleus, yet uncoil enough in certain places to allow the cell’s machinery to read out the chemical information storage for the different programs that run the functions of a cell. 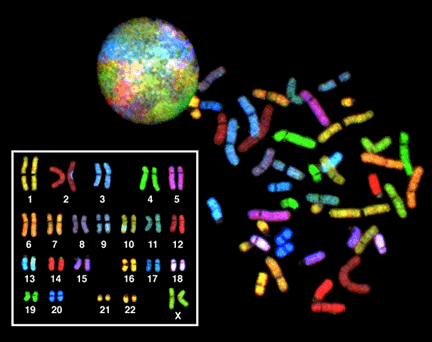 This image shows human chromosomes stained with fluorescent dyes to mark those of different length and structure (each containing different genes, or genetic programs). A microscopist can then use a computer to arrange the chromosomes into pairs that match each other–these represent the two copies of each chromosome that came from each of this person’s two biological parents via the egg and sperm. This paired arrangement of chromosomes (the boxed area of the photo) is called a karyotype. Such images can be very helpful in studying aspects of normal chromosome structure, but they also can identifiy chromosome defects associated with certain human conditions, such as Down syndrome, in which a person has three copies of chromosome 21. It’s easy to see in a karyotype how many chromosomes each kind of organism has; in humans, it’s 46 (23 from each parent). That’s because chromosomes coil up very tightly when the cell is getting ready to divide (it’s easier to move DNA around for cell division when it’s coiled up into tight little segments), and scientists can choose these cells when creating the karyotype image. But notice the picture at the top of the photo: here, the DNA fills the spherical outline of the nucleus, the chromosome colors are more diffuse, and it’s hard to see where one chromosome begins and the next one ends. That’s because chromosomes uncoil quite a bit when the cell isn’t dividing, so the DNA can be accessed to run the programming of the cell. That picture is pretty, and you can see that there are different chromosomes there, but you can’t say for sure exactly where each chromosome is, how long it is, how each relates to its neighbors, where its ends are, etc. That’s exactly what this new study aimed to find out. By using complicated biochemical techniques to detect where neighboring regions of DNA are throughout the nucleus and some serious computing power to assemble this information into 3-D modeling programs, researchers from the University of Cambridge and their collaborators provided the first really clear spatial organization of the nucleus of some specially selected mouse cells. They also showed that the most active regions (from a gene programming standpoint) of each chromosome are found tucked together in the center of the nucleus, and the less information-heavy regions cluster toward defined regions of the edges of the nucleus. So who cares? Why bother writing a blog post about one new piece of information that isn’t impacting anyone’s life today, and that a relatively small number people in the world other than me are probably excited about? For starters, I don’t think you have to be a scientist to admire the skill involved in figuring out a way to study and animate the workings of the cells of living things. It’s pretty cool to watch colorful 3-D animations of things we can’t observe with our own eyes! Technology has driven an amazing amount of innovation and insight in almost every area of science research (and people’s lives in general). Secondly, I think it’s important to share something that I, personally, found exciting this week in science. My own contributions in the area of chromosome biology go back a few years now, but it’s great to see a technical breakthrough that could open the doors to asking and answering a whole new set of questions in genetics and cell biology. I genuinely enjoyed the discovery as I read the (really complicated!) scientific article and pieced together their new story. Science is an ongoing, collaborative enterprise that builds incrementally on the findings that came earlier. It’s not just about knowing the facts that we already established, but understanding how new ideas arise and are tested and built upon. Finally, I want to plug the value of basic scientific research. If we want to understand something that impacts human health, like cancer, for example, we need to understand how cells are programmed when they behave normally and abnormally. We know changes in cell programming can lead to cancer, yet we still don’t understand all of the aspects of genetic programming in cells or the factors that influence those changes. Learning more details about nuclear architecture will enhance our ability to explore new questions about how genes are regulated. Basic science builds a foundation for applications far and wide. And sometimes, it generates an eye-popping, rainbow-colored animation to remind us how cool that can be.